Common patterns of numerical and/or biomass phyto-plankton variations in space and time reveal the balance between nutrient and light availability and phytoplankton requirements and losses. Numerical and biomass equilibrium in phytoplankton communities is achieved (and can be observed at different scales) as a result of the phytoplankton's high potential resilience, enabling local communities to attenuate unbalanced conditions, and to adapt to fluctuations of limiting factors, which occur on a range of scales from hours to centuries, as well as from meters to hundred of kilometres. 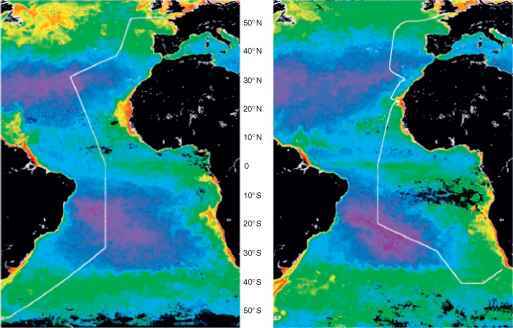 Large-scale patterns of phytoplankton numerical and biomass variation have received much attention. However, evidence from coastal marine ecosystems shows that phyto-plankton species manage to balance environmental conditions even while settling along the water column, resulting in deterministic phytoplankton size structures which are perturbed when storm events disrupt water column stability, determining mixing conditions. Since scales are measures of how organisms perceive their environment, and what is small and fast for an organism may be large and slow for another one, variance cascading of ecological processes, from large and slow to small and fast, is a point that deserves the utmost attention. Phytoplankton biomass in relatively large bodies of water, for example, coastal marine ecosystems and large and/or deep lakes, shows highly auto-correlated spatial and temporal patterns (Figure 1), revealing a balance between nutrient and light availability and phytoplankton biomass; descriptions of spatial and temporal patterns and manipulative enrichment experiments have shown that when light conditions allow phytoplankton growth, natural waters are an environment of striking nutrient deficiency, so that competition is likely to be extremely severe. Therefore, a dynamic equilibrium characterizes the auto-correlated phytoplankton biomass patterns, where nutrient and light availability, phytoplankton absorption and reproduction, and zooplankton grazing represent the contrasting forces whose balance varies predictably in space and time at certain spatial and temporal scales. As regards space, in large aquatic ecosystems (i.e., lakes and sea), three main spatial scales can be detected: one, up to roughly 1 km, which is dominated by horizontal turbulent diffusion; the second, between 1 and 5 km, at which the effect of turbulent diffusion is overridden by growth, grazing, and vertical mixing; the third, at scales larger than 5 km and up to 100 km, at which phytoplankton distribution is controlled mainly by advection, eddies, and upwelling. Diffusion processes imply turbulent diffusion caused by a wide range of movements in three dimensions, whereas advective processes are related to large-scale horizontal and vertical movements of water (and the suspended organisms). Spatial patterns can be detected as chlorophyll density variation by means of satellite images. Strong auto-correlated spatial patterns occur along transects from the coastline to open waters (Figures 1a (Adriatic Sea-Mediterranean Sea) and 1b (Lake Michigan-North America), across fronts and up-welling zones, even at the largest spatial scale of the oceanic transects (e.g., the Atlantic transect, Figure 2), across coast-open sea gradients, eddies, and temperature gradients. In large and deep lakes of North America, 60-80% of the phytoplankton spatial variation can be accounted for in terms of depth and light, temperature, nutrients and zooplankton density. Figure 1 Auto-correlated spatial and temporal patterns of phytoplankton biomass in natural waters. 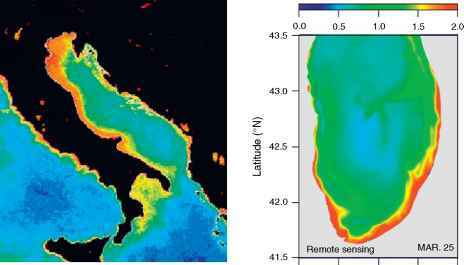 (a) Spatial distribution of Chl a in the Adriatic coastal marine areas - Mediterranean Sea. (b) Spatial distribution of Chl a in the Lake Michigan - North America. 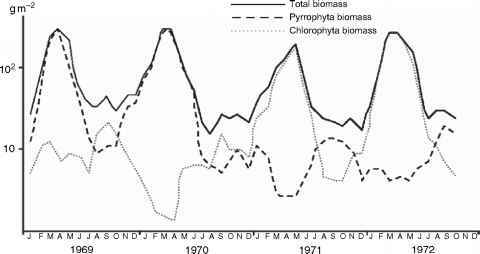 (c) Seasonal variations in phytoplankton fresh weight biomass 1969-72 (g m~1) in trophogenic layer of Lake Kinneret, Israel. (b) Reproduced from website of Marine Ecosystem Dynamics Modeling Laboratory at School of Marine Science and Technology, University of Massachusetts - Dartmouth (http://fvcom.smast.umassd.edu/), with permission. (c) Reproduced from Berman T and Pollingher U (1974) Annual and seasonal variations of phytoplankton, chlorophyll, and photosynthesis in Lake Kinneret. 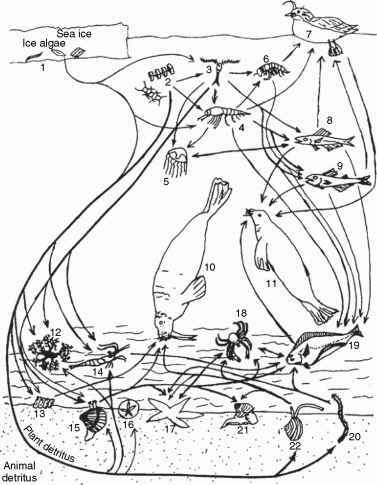 Limnology and Oceanography 19: 31-54, with permission; copyright (2008) by the American Society of Limnology and oceanography, Inc.
spring and late summer (Figure 1c). Early spring pulses are generally dominated by diatoms, which benefit from the availability of silicates, while late summer pulses are generally dominated by dynoflagellates. Larger-scale patterns, following nutrient enrichment from the catchment area of the waters, are also commonly observed in lakes and relatively enclosed seas. Both temporal and spatial patterns of numerical and biomass densities in phytoplankton communities are related to directional and predictable variations of light limitation, nutrient limitation, and zooplankton grazing. Light and nutrient limitations have independent effects on phyto-plankton communities but they also have a synergic effect mediated by water column stability. These relationships will be described in the following sections. Figure 2 Composite chlorophyll a images of the Atlantic Ocean (551 ° N-551 ° S by 601 ° W-201 ° E) for the months of (a) May 2004 (AMT14), (b) October 2004 (AMT15), and (c) June 2005 (AMT16). The tracks of each cruise are shown as a white line and are the same on each cruise between the Equator and 201S along the 251W meridian. Reproduced from Robinson C, Poulton AJ, Holligan PM, etal. 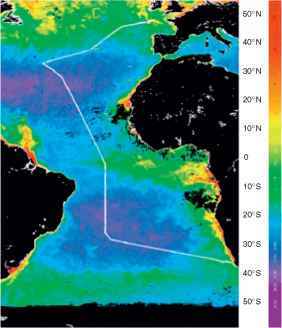 (2006) The Atlantic Meridional Transect (AMT) programme: A contextual view 1995-2005. Deep-Sea Research II53:1485-1515, with permission from Elsevier. where r is the cell radius, D is the substrate diffusion coefficient, and AC the nutrient concentration gradient from the cell surface to the bulk media. As a consequence of the body size dependency of light absorption, nutrient uptake, and diffusion, the three phytoplankton size fractions (i.e., pico-phytoplankton (cell diameter < 2 mm), nano-phytoplankton (cell diameter between 2 and 20 mm), and micro-phytoplankton (cell diameter >20 mm)), together with the phytoplankton size spectra, show deterministic spatial patterns which are relevant to understanding phytoplankton community organization, although they are not treated specifically in this section. where I0 is the incident light intensity, z is the water depth, Iz is the light intensity at depth z, and k is the light extinction coefficient. The light extinction coefficient is affected by both solutes and suspended particles, including phytoplankton cells. Even in pure (distilled) water, only about one half of incident visible light energy remains at a depth of 10 m and only 1% at 130 m. The thickness of the layer which benefits from more than 1% of the incident light (i.e., the euphotic zone) is very restricted in most oceans and lake ecosystems and only in very shallow and clear waters does the euphotic zone reach the bottom. Although many phyto-plankton species are adapted to photosynthesizing at relatively low light intensities, the attenuation of light along the water column ultimately limits primary production. where B is the biomass of species , I0 is the incident irradiance, y is the maximum growth rate per unit biomass, K the half-saturation constant of a Monod-type function, and m is the phytoplankton biomass loss as a result of respiration, grazing, sedimentation, and washout. Residence within the euphotic zone is essential for autotrophic organisms. However, since most phytoplankton species, with the major exception of Cianophyceae, cannot regulate their buoyancy and sink in the water column at a speed depending on their size, shape and appendices, as well as on the difference between the density of the cell and that of the water, their permanence in the euphotic zone is closely related to water column stability and mixing depth. Turbulent water movement influences the light to which phytoplankton are exposed. If the mixing depth (dm) significantly exceeds the euphotic depth (de), then the phytoplankton is alternately carried into and out of the illuminated layers; primary production and phytoplankton biomass are strongly limited under these conditions. If de > dm, phytoplankton can survive outside the mixing layer, provided they have some means of regulating their vertical position within the euphotic layer. The predominance of flagellates in deep, transparent tropical seas and in the metalimnia of stratificated lakes is made possible largely by their moti-lity. Extensive vertical mixing in lakes and seas generally favors the dominance of diatoms. Apart from the morphological adaptation which enables diatoms to achieve suspension in turbulent eddies, they are adapted physiologically to contend with fluctuating irradiance conditions. Average photic conditions (related to the interaction between spatial and temporal fluctuation in water movements) and the suspension adaptations of phytoplankton strongly affect the rate of biological production, and account for the scarce winter development of phytoplankton at high latitudes. Coast-open sea (or open lake) spatial patterns and manipulative enrichment experiments have shown that phytoplankton can become limited by the availability of nutrients when light and temperature are adequate and loss rates are not excessive. Phosphorus (P) and nitrogen (N), which are required in the largest amounts, are the two most common limiting nutrients. Ecological stoi-chiometry describes the relative requirements of phytoplankton groups with respect to the different nutrients entering the cell's anabolism. As a general average for marine phytoplankton, the uptake ratio of C, N, P, and S is 106:16:1:0.8, respectively. Therefore, the balance between the requirement and the availability of limiting nutrients, whose spatial and temporal variations determine the observed patterns of biomass density, depends on lateral nutrient inputs, on deep water nutrient inputs, and on nutrient turnover rates within the water column. Silicates, for example, strongly limit diatom growth, mainly because of their low turnover rates within the euphotic layer; diatoms are limited at silicate concentrations of below 1.4mgl-1 - which are rapidly reached during the spring blooms. On the other hand, P has a much faster turnover rate than N in the euphotic zone, partly due to inorganic excretion by zooplankton grazers, allowing phytoplankton growth even at very low P concentrations. Since almost all nutrients have sedimentary biogeochemical cycles and terrestrial origins, the coast-open sea(lake) patterns arise from the progressive dilution of terrestrial inputs in aquatic ecosystems.